At the edge of the Zingaro Nature Reserve lies the ancient Scopello (from the Greek word "Skopelos" that means "cliff”), a small and pleasant village that was built around a 16th-century “baglio”, on the site of a former Moorish hamlet. As you will discover during your holidays in villas in Scopello, this nice courtyard is now the heart of the village: you will find ceramics and souvenirs shops, as well as boutiques, cafés and restaurants lying under the shadow of a large eucalyptus, and of course shops that provide you with food, drinks and ice creams. Close to the village, along the coast, you will discover the old tuna fishery ("La Tonnara di Scopello"), located around a small bay, where dramatic and impressive rocks with prickly pear cactus on tips, called “faraglioni”, make the seawater look like a lagoon. Here you can go swimming in a crystal clear sea that has been a set for more than one world-famous movie (such as “Ocean’s thirteen”); the seabed is also very rich and interesting, and will be a delight for all the scuba-diving lovers. The “tonnara” is no longer used for its original purpose, but you will find there a little seafaring museum with traces of the tuna fishing activity (that was closed down in the 1980s). Together with the Tonnara and the Faraglioni, you’ll find other charming beaches in Scopello: the Guidaloca bay is a white-rocks beach just three kilometers far from the highway exit to Scopello (coming from Castellammare del Golfo); Cala Rossa is one of the most famous accesses to the sea in this area – a rocky beach such as Cala Bianca; while Cala Mazzo di Sciacca is a sandy beach right beyond the Faraglioni. Diving enthusiasts will be happy to know that there are a lot of wonderful locations that can be reached only from the sea, such as Santa Margherita cave, with very ancient pictures of sacred images on the inside. 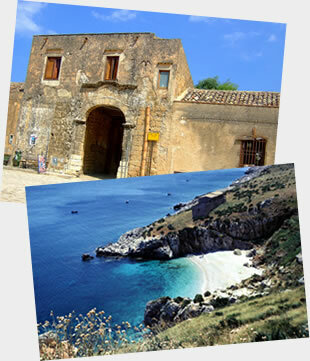 History, legends and wonderful scenarios: this is what you will find during your holiday in Scopello. One of the most enchanting locations in Sicily indeed, full of charming spots where to find exclusive villas overlooking the Tirrenian sea. This little village, and the whole Trapani district as well, is quite famous for its various and delicious chances it offers to taste typical Sicilian food: if you wish to try the famous "pani cunzatu" (local bread with anchovies, herbs, tomatoes, local cheese and oil) or sfincione, the Sicilian equal of pizza, you should definitely go to the village baker. You can enjoy this traditional food in the bakery garden. And then of course you can’t miss the typical “trapanese cous cous”, an ancient recipe coming from the Arab tradition, and “trapanese pesto”, made with basil, tomato, garlic and almonds: a really delicious seasoning for pasta… Learn the recipe and then surprise your guests once you’re back home!